Balls Pyramid is a striking example of the penultimate stage in the marine planation of a volcanic island. It is a remarkable monolith of basalt that rises spectacularly to a height of 551 m (Fig. 1), as wave erosion has truncated thew top of a volcano, 25 km south of Lord Howe Island in the Tasman Sea (Fig. 2). There are numerous volcanoes that now form 'high islands' in the tropical Pacific Ocean. Almost all of these are surrounded by coral reefs which thrive in high wave energy settings in the tropics. Reefs attenuate the waves, which break on the reef crest, protecting the slopes of the volcanic islands from erosion. Balls Pyramid lies just south of the southernmost reef in the Pacific Ocean, which is on the western margin of Lord Howe Island. As a consequence wave energy can reach the flanks of Balls Pyramid which rise as steep 'plunging cliffs', like those around the eastern and southern margins of Lord Howe Island, where the island is unprotected by reefs. Balls Pyramid is composed of nearly horizontally-bedded lava flows, the remnants of a volcanic plug formed in a former vent of a volcano. Potassium-argon dating indicates it is similar, or slightly younger in age, than Mount Gower and Mount Lidgbird on Lord Howe Island which have been potassium-argon dated to 6.4 Ma. After their eruption as a shield volcano, the volcanic hillslopes have been truncated to form a broad submarine shelf. Balls Pyramid sits in the centre of this shelf, which forms a platform that is about 20 km from north to south, and averages 10 km wide (Fig. 3). It has an average water depth of around 50 m. A similar but slightly larger shelf surrounds Lord Howe Island, and the two platforms are separated by a canyon that exceeds 500 m in depth (Fig. 4). Ultimately wave erosion will completely truncate the volcanoes. There has been some controversy over the development of plunging cliffs, termed plunging because they continue below the water line into deep water. The efficacy of marine abrasion was recognised by Charles Darwin who visited St Helena in the south Atlantic Ocean and described the vertical cliffs around the margin and the planated shelf. He disputed the view, which was then widely held, that these plunging cliffs were abraded at wave base, the depth to which orbital velocities associated with wave motion are felt (equivalent to half of the wave length, the distance between successive wave crests). He realised that waves that break exert a greater force, and that it is necessary for large waves to reach the cliffs unimpaired to have maximum erosional capacity. 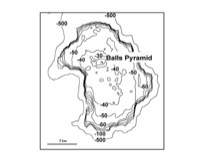 We now understand that the level of the sea has varied over an amplitude of 100-120 m over the Quaternary ice ages, and it appears likely that much of the erosion of the shelf around Balls Pyramid occurred relatively soon after eruption of the volcano, and at times when the sea was lower than at present. The efficacy of planation would have decreased as broad platforms developed in front of the vertical cliffs and talus accumulated at their toe. 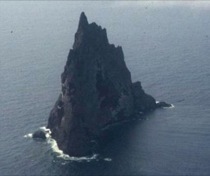 Both Balls Pyramid and Lord Howe Island lie on the margin of the Lord Howe Rise, a remnant of continental crust in the Tasman Sea, and on the Australian plate which is moving northwards at around 6 cm per year. These truncated volcanoes will eventually move into more tropical waters. At present the shelves are covered by calcareous sediments derived largely from temperate organisms, but they are likely to become suitable for coral reef development, as is already possible on the western margin of Lord Howe Island. This limit to reef growth has been sensitive to past climate changes and is likely to respond to future changes in climate. Recent observations on the shelf around Lord Howe Island have revealed a fossil reef in mid shelf around almost the entire island, indicating past variation in the extent of reefs there. Balls Pyramid represents the penultimate stage in the planation of a volcanic island, and its position is at a critical point on the northward-migrating plate which is about to carry it into reef-forming seas. It is likely to be completely truncated by wave erosion in the future, unless a coral reef forms around it and protects its shoreline. Kennedy, D.M., Woodroffe, C.D., Jones, B.G., Dickson, M.E. and Phipps, C.V.G. (2002) Carbonate sedimentation on subtropical shelves around Lord Howe Island and Balls Pyramid, Southwest Pacific. Marine Geology 188, 333-349. Woodroffe, C.D., Dickson, M. E., Brooke, B.P. and Kennedy, D. M. (2005) Episodes of reef growth at Lord Howe Island, the southernmost reef in the southwest Pacific. Global and Planetary Change, 49, 222-237. Woodroffe, C.D., Kennedy, D.M., Brooke, B.P. and Dickson, M.E. 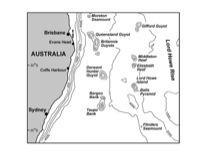 (2006) Geomorphological evolution of Lord Howe Island and carbonate production at the latitudinal limit to reef growth. Journal of Coastal Research, 22, 188-201.